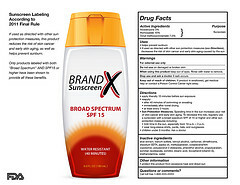 A sample image from the FDA for its new sunscreen labeling rules. The next time you hit up a drugstore, take a close look at the sunscreen aisle. The products there now may look markedly different this time next year. Earlier this week, the U.S. Food and Drug Administration issued new requirements for the way makers of sunscreen can label and market their products. When the rules take effect in 2012, the term “broad spectrum” can only be used to describe products that protect against both ultraviolet A (UVA) and ultraviolet B (UVB) light. Sunburn is primarily caused by UVB, but UVA (which is not addressed by current “sun protection factor”, or SPF, labels) is a major cause of skin aging and contributes to skin cancer. In addition, any sunscreen that is not broad spectrum, or one that has an SPF between 2 and 14, must carry a warning that the product has not been shown to protect against skin cancer or early skin aging. The FDA is also telling manufacturers to do away with popular guarantees like “waterproof” or “sweatproof,” and with the term “sunblock.” The agency says there are no such things, and is calling for sunscreen bottles to instead note how long they are water or sweat “resistant.” Finally, the FDA wants to set a maximum SPF value of 50-plus because it says anything higher doesn’t provide a significant amount of additional protection. So how do the rules change the game for manufacturers? What about consumers? Karen Glanz, a University of Pennsylvania professor of epidemiology and nursing who has conducted research on skin cancer prevention, says the guidelines have the potential to “eliminate a certain amount of noise from the marketplace,” for sunscreen. Over time, she adds, it’s likely that manufacturers may devote fewer resources to making tanning oils or low-SPF products that now must carry a warning about their limited protection. But she adds that “star systems” for nutrition labels or other easier-to-understand grading systems are typically unpopular with many product manufacturers — nobody wants to advertise that they failed to make the grade.